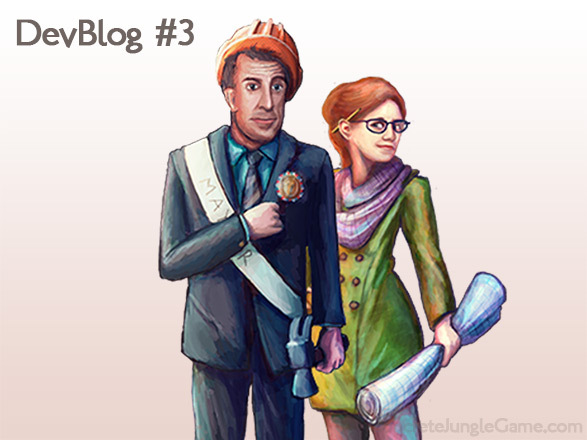 November 2014 – Page 2 – ColePowered Games Ltd.
Hello there! The Kickstarter and Greenlight have had an *amazing* week! So much so infact, that the target has been met and doubled and we’ve been greenlit! I am incredibly grateful to everybody who has pledged and voted, you are the best! I thought I’d share with you the development of Concrete Jungle up until now- it has been through a whole lot of re-working, re-starting, re-imagining, re-everything really. The first ideas for a follow-up to my original game MegaCity came in the form of just making everything bigger and better. Mid way through 2012 I took the original game and completely re-coded everything from the ground up. I had learned a lot since first making the game, and I wanted to make it faster, sleeker and just generally improve the quality of the code, UI, sound and graphics. The original idea being I would simply build upon this new code and produce a sequel. What I ended up with by the end of the summer was a much slicker and improved version of the original. 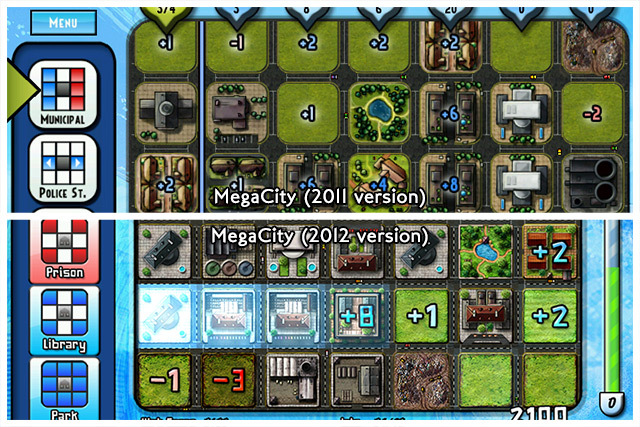 The original MegaCity release compared with the re-worked 2012 version. All this ended up as a free update for the original game in the form of MegaCity 1.60. It felt like a good idea to reward people for buying MegaCity in the first place, which was a bit rough around the edges. The release of MegaCity 1.60 improved sales and along with the android release kept me ticking over. Months later, I returned to development, but with a whole bunch of new ideas. One of the first sequel prototypes. Look at that silly amount of debug info everywhere! However, early prototypes were disappointing. Through changing the core mechanics I inadvertently ended up removing a lot of the difficulty and challenge. 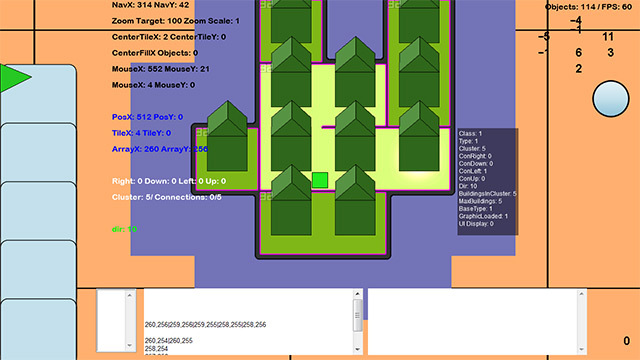 In this prototype you built a city out from the centre of the screen, and while it looked cool, it really softened one of the core mechanics that made the original fun- space management. The early prototypes had you build outwards from the centre of the map. The removal of columns made the building scores next to meaningless- the more buildings you placed the harder and more complicated the game got. It quickly got to a point in the game where there was just too much to analyse to find the best play, and when that happens, the game stops being fun. 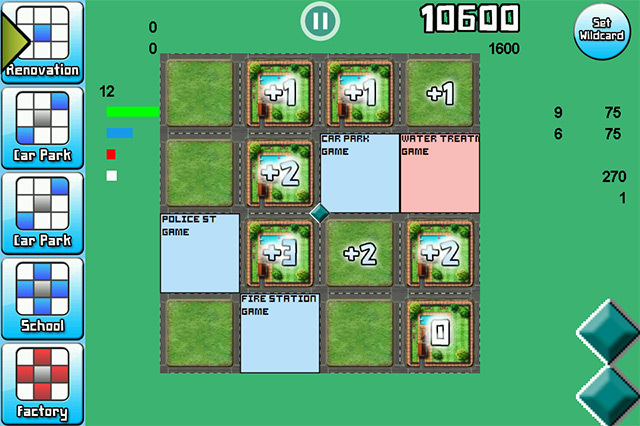 Although the original MegaCity obviously featured numbers in-game, it was very basic stuff and more about logic and decision making combined with a little luck. The build list mechanic also needed some TLC. One of the criticisms of the original is that it can be too random at times. Late in the game you are pretty much completely at mercy of RNG. On the other hand having more control over buildings also makes the game too easy. Again, it removes a core component of the challenge- being dumped with a building you don’t necessarily want to place but having to find a place for it anyway, without ruining your intended plans. S’all part of the job! At this point I decided to explore a bolder new direction by making the project more of a traditional city builder/management game- perhaps ditching the MegaCity name. I made a brand new engine (again) and a brand new prototype (again) which was about 50% MegaCity, and 50% traditional city builder. It sounds great doesn’t it? It wasn’t. I think some part of me thought by just mashing two good but separate ideas together would create something special. Even though I had worked out all the mechanics in my head, when they actually came together it just never felt much like a game. 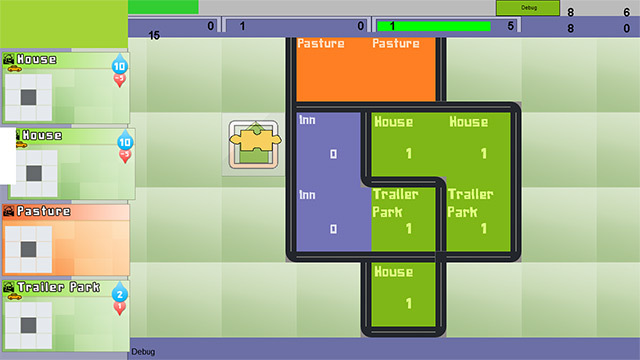 For some reason I started making a nice UI for this prototype. It’s not completely wasted, I liked the clean white look so I used it in Concrete Jungle. This prototype was based around a traffic mechanic whereby you could run traffic past commercial buildings to increase their point value, but running it by residential buildings decreased their point value. In my head it would be simcity meets tower defense. It was neither. The game didn’t have enough of the management aspect of games like SimCity to make it fun- the numerical mechanics I wanted to keep from MegaCity constrained that too much. 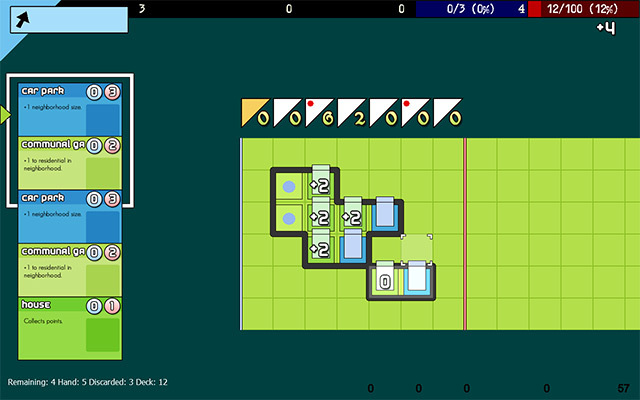 While the traffic/point mechanic was again too complicated, requiring the player to make too many calculations before arriving at a considered move. This prototype tried to straddle the gap between management game and puzzle game like it wasn’t there- the two core ideas I wanted to mix together just weren’t compatible. It’s why management games like SimCity hide their inner workings a bit from the user: Buildings can be placed in a more ‘correct’ or ‘wrong’ place, but feedback is never so specific that you find you need to solve complex math equations to play the game (unless you’re this guy). You don’t need to be the best city builder in order to have fun in SimCity, half the pleasure if just playing around in your own sandbox. MegaCity is about the challenge (and I didn’t want to loose that because it’s kinda what makes it a bit unique). So it simplifies city planning down to the basics to make it easy to play in order to make that possible. That’s where I was going wrong with these prototypes. This really was a case of ‘keep it simple stupid’. Perhaps there is a solution to this problem, and perhaps I’ll return to this concept since I would love a simcity/TD mashup game that works- but it’s not this project. It was the hardest concept to ditch, even once I’d seen the flaws. So yet again I went back to the drawing board. Feeling like I had been too ambitious with the last concept, I went back to the original game and tried to preserve exactly what was good about it. The limitations of the building system, and the simple scoring system. These elements had to stay. This is finally the prototype that worked- and was developed to what you see now! Now we’ve arrived at the current build which has progressed in recent months to become ‘Concrete Jungle’. -Decks & deck building! Deck building, I’ve decided, is the solution to the random-but-not-too-random problem. The building list is generated from the cards in your deck which are shuffled and cycled through. You don’t know which order the buildings are coming, but you do know what’s coming. You’ll start with 12 basic cards, and as your city progresses you’ll earn ‘buys’ which you spend on new cards to add to your deck. When you enter the buy screen you’ll be presented with a choice of 4 different random cards to add, and you pick the card of your preference. This makes it a kind of mashup of Dominion’s deck building, and Hearthstone’s Arena mode. I’m pleased with this- the element of choosing new cards to add to your deck as your actually playing the game is really cool. You are building your deck throughout the game as well as the city. As the game progresses you’ll get cards which allow you to ditch and reform existing other cards in your deck, so you slowly get more and more control over your buildings- yet it takes time- and over time the difficulty increases (classic MegaCity)! -Neighborhoods! Another idea I’ve had for ages that I just didn’t get to gel until the most recent prototype. The idea that several buildings can clump together and form a neighborhood and get some kind of bonus. 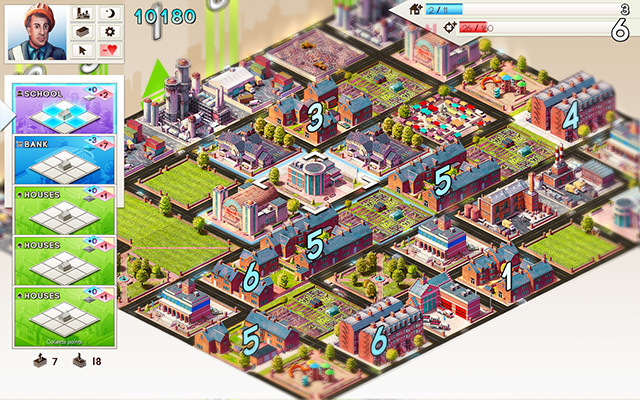 In Concrete Jungle, buildings of the same class (residential, commercial etc) can be joined together in groups of up to 4. You’ll also get buildings that can buff the whole neighborhood, and buildings that can expand the neighborhood. This allows a new dimension of positive/negative buffs other than the limited 8 surrounding squares of the original. It also gives a neat little visual way to handle roads- they are built around neighborhoods. -Competitive Mode! While for now I am focusing on expanding the play-against-your-own-past decisions mode (got to come up with a better name for that!) This alternate mode is something I definitely want to explore with the game. 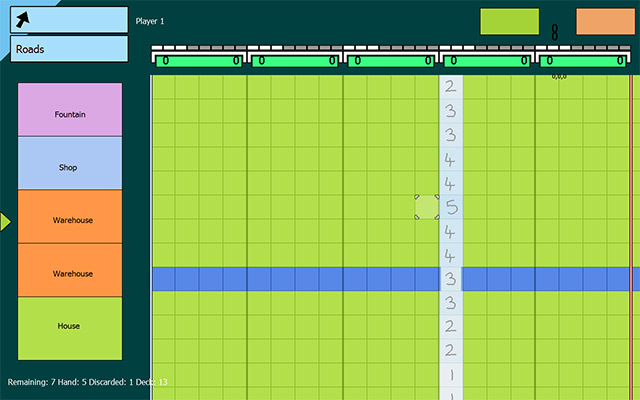 I’ve got an early version of a competitive mode where 2 teams of 1 or 2 players compete together to clear the columns. 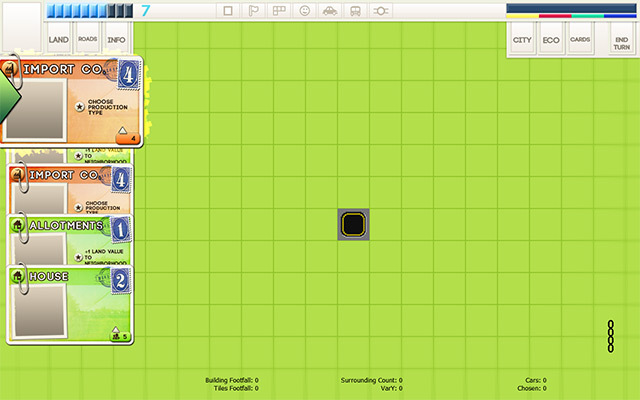 I’ve taken the core concept and made it multiplayer, and it works barring some balancing issues I’ll have to tackle. The competitive mode gives it a whole new dimension, and it feels a bit like playing chess. I can’t wait to reveal more on it. 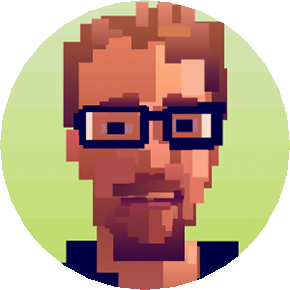 -Isometric! It looks cool and is reminiscent of those awesome 90s PC titles. -A much, much bigger pool of buildings! Now that the mechanics have been expanded, there’s room to feature buildings that have a greater variety of effects! It took a lot of ambitious failings to get to this version, but I’m glad they happened, I feel it’s made me a better game designer. I’m just so excited that I get to complete it to the standard I envisioned. The kickstarter and greenlight campaign could not have gone better! See you next time, I have a game to work on!